APSET 2018 Online Application Form Submission instructions,Hall tickets, Results? APSET 2018 Online Application Form: filling instructions for apset online application submission. 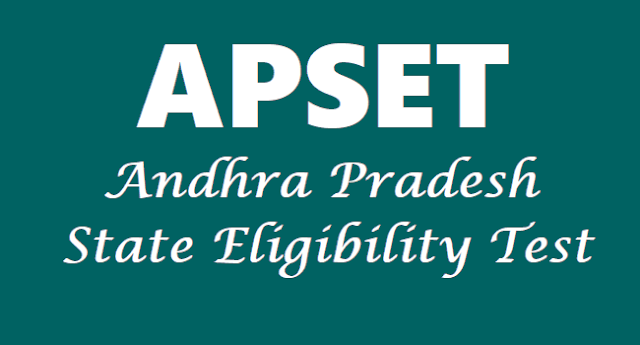 Andhra Pradesh State Eligibility Test 2018 to be conducted by Andhra University, Important Instructions, APSET 2018, APSLET 2018, AP SET 2018, AP SLET 2018, AP State Level Eligibility Test 2018, APSET 2018 Syllabus, Eligibility Criteria, How to Apply, Online Application Form, Registration Fee, Hall Tickets, Results, Last date, Exam Date and Exam Pattern details are given below. State Eligibility Test for AP/APSET 2018: Now a days JOB is not only the minimum need of a person it is a passion. Candidate is expecting dual profits from his work i.e pursue satisfaction and psychological satisfaction for these both. He is ready to give up beyond the expectation of the examine / Interviews and for that he is mentally prepared for maximum hard work with perfect planning. As competition is very high, It is very tough task to get through the any competitive exam with more percentage. This is possible only when we develop our competitive skills in the exam point of view. These skills are tested in many levels. Now we are going to know about SET which is one of the eligibility test. SET is the Eligibility test for teaching in degree colleges as a Lecturer and teaching in the Universities as an Assistant Professor and it was conducted nation wide in the past. The above said test was conducted in the English and Hindi languages only, Later this was conducted to individual states to conducted in their local languages as well to make an opportunity and to encourage the rural people. SET was and is conducting by Osmania University before and after separation of Andhra Pradesh i.e.,for both the state of AP and Telangana State. This an eligibility test for candidates of PG for recruiting as Assistant professor in University / Colleges / Institutions. Who are eligible for SET? Candidates who have completed their post graduation with 55 percent mark for general category candidates and 50 percent marks for BC/SC/ST/PH/VH category candidates. Candidates who are pursuing the PG final year also can appear in the exam but they have to obtain their PG certificate with required percentage within one year without fail. Any deviations in the PG final year candidates will be treated as disqualified. Ph.D candidates / degree holders of UGC are exempted from SET i.e., they are directly eligible for the post without appearing in the SET. Candidates should login first and register online, then they have to create an ID and Password with the own email id, these are used in further process. So they have to prepare their ID and Password. Details should be submit as per the procedure and generate a "Bank pay-in-slip"(Print out). Bank pay-in-slip should be paid in nearest SBH bank. After 24 hours upload your bank payment details and scanned Photograph and signature in JPG/JPEG format only and Photograph and signature should not be more than 50kb each. There will be 31 subjects in the list of SET which are adopted from CSIR/ UGC-NET syllabus and they are as per the UGC guidelines. SET exam consists of three papers, which are conducted on the same day with separate sessions. Question paper will be in two languages i.e., English and Telugu only. Paper-I: This paper consists of 50 question with 100 marks. Candidates should attempt only 50 answers. In case more than 50 answers, first 50 answers will be considered and remaining will be ignore even though they are correct. Paper-II: This paper consist of 50 question with 100 marks. Candidates should attempt all the three papers, they have to submit bar coded OMR sheet which will give to candidates during the exam during the exam and allowed to carry a carbon printout. There will be No negative marking in this test. Step-I: Candidates should obtain minimum marks separately in all the 2 papers. Step-II: A merit list (Category wise and subject wise ) will be prepared from step one. Step-III: Top 15 percent of the candidates from the merit list are declared as qualified candidates of SET both the states of Andhra Pradesh). 2. Fill in the required information and enter a password of your choice. Please note that this password and the email id entered will be used to login and complete your registration process. 3. On successful registration, login to the website using your registered email id and password. 4. Fill in the remaining details i.e. address for correspondence, educational qualification etc. and click "Submit". 5. Click on "Generate Bank Pay-in-Slip" and print the bank challan. 6. Visit the nearest State Bank of Hyderabad branch and make the payment towards application fee. 7. Login to the website after 24hrs and update the bank payment details. 8. Upload your scanned photograph and signature in jpg/jpeg format only. Please ensure that the file size for photograph and signature is not more that 50kb each. 9. Select the appropriate subject group, medium of exam and exam city to complete your registration process. Final words: Our life is about choice, when you was kid our parent make our choice but when you grew and matured, you should learn to make your own choices. Now it's to make one of the most critical decisions of your life. The choice is really a series of small decisions, the decisions to change your future. Perfect planning makes easy to take a decision. Perfect and more references of subject books along with time management are the the success tools of a competitive exam winner. Along with these confidence play role in achieving the target.